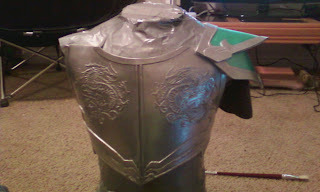 First I started out drawing out the shape of the armor on a piece of paper and fitting that over a duct tape double that I made of me (with binding because I crossplay more than anything) to make sure it was how I wanted it. 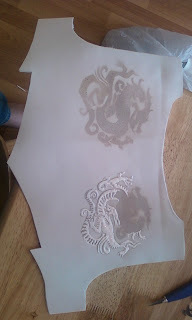 I then transferred that over to my 3mm roll of craft foam and cut out two identical pieces (since I didn't have 6mm.) And then glued them together to make a more sturdy piece. 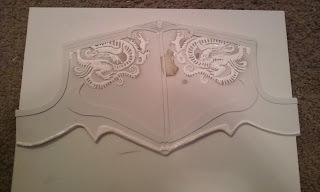 The design was scanned from the Dynasty Warriors artbook and scaled to the right size, printed on card stock, carefully cut out with an exacto knife, and then used as a stencil on the foam. After the dragons were finished and dry, I added strips of craft foam to do the rest of the detailing, as well as a bit more 3D paint as well. And then I moved on to the back and did the same. 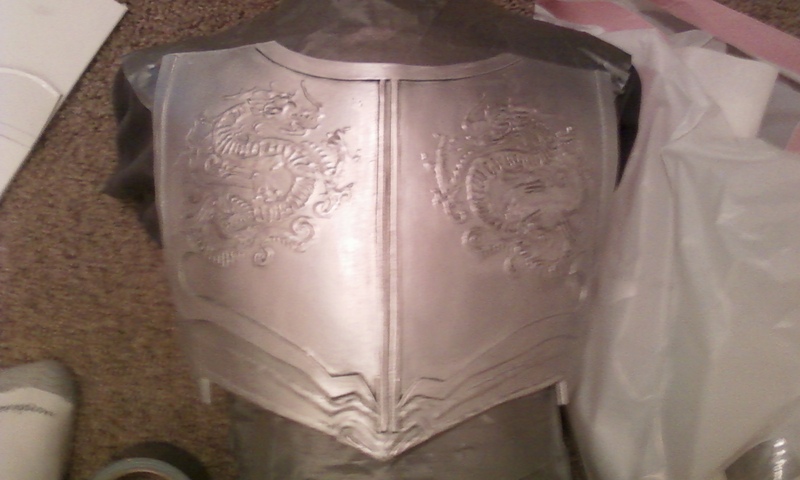 Don't worry, that ugly blotch will get covered up with the paint. 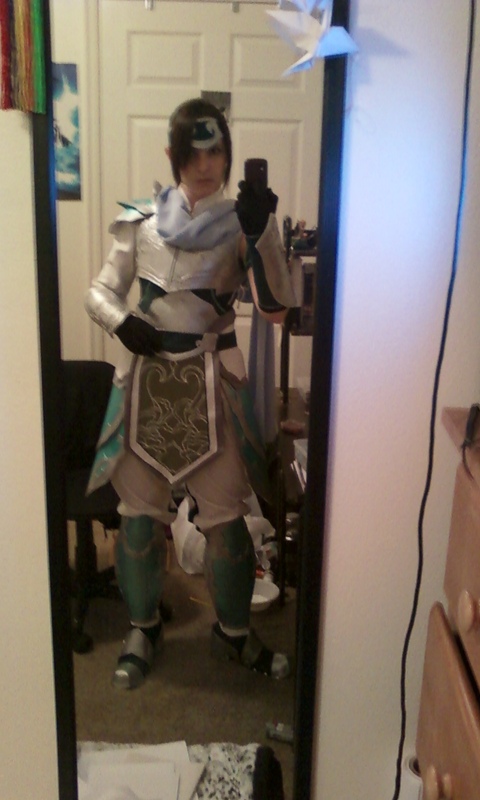 At this point, I have to shape, stabilize, and seal the foam. 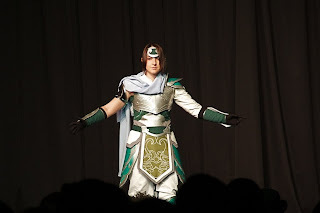 I had my duct tape dude at the ready, and using a single burner of my stove, I carefully heated up the foam and once it feels like leather, I placed it on my duct tape guy, and pressed it evenly over the curve of the chest using a pillow to get fairly even pressure. Once it cooled, it keeps its shape pretty well. Now, everybody knows that craft foam is not durable at all, so to make sure it didn't rip or whatever, I had to put some crinkle gauze on the back. 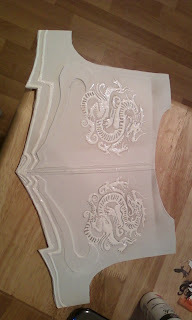 First, I coated the back with Elmer's glue. Then I laid a layer of crinkle gauze, not worrying yet about cutting it to the right shape. That can come later. Once that dries a bit, I will slather more Elmer's glue over the back until the crinkle gauze is well covered. 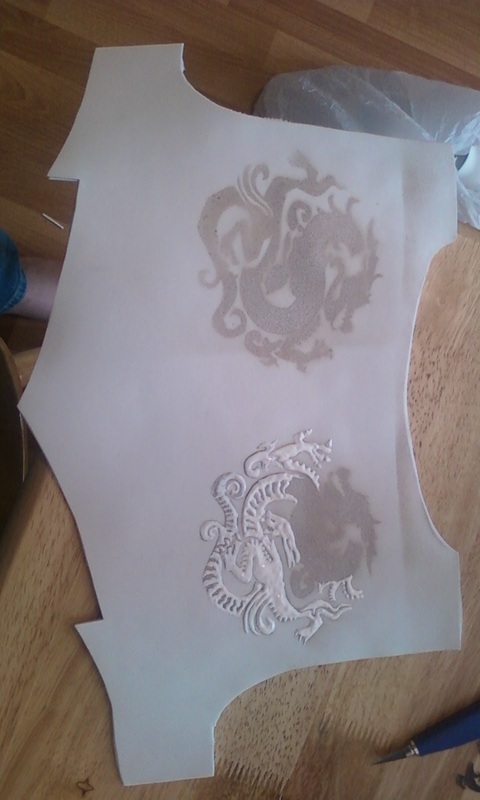 And then it needs a couple hours to dry. Using a paper towel (or my fingers because who cares about having a natural skin color?) I simply rubbed this stuff all over the sealed armor. The more friction you give it, the shinier it can get. But make sure to rub well, or you might find that you've missed a spot and you'll get this stuff all over everything, which is also why a final layer of that glue concoction is not a bad idea. This is what it looks like afterward. Then of course I need to do closures and such. I cut out little strips of that fake leather that Joann's carries, and made straps to connect the front and back. On the sides that fit under the arms, I punched holes and placed grommets in for lacing. There is also a pauldron that needed to be attached, and needed to be removable for transportation and such. So, I had to glue/press/punch/struggle with putting in snaps. You know, the ones with the evil little teeth that you press (hammer) into another piece to make it stay? Yeah, those ones. But I didn't always want them to show through, so with some of them, I just slathered some e6000 on the back, pressed the teeth through the foam, and prayed that they would stay in place (they have.) That way, you can't tell there is a snap there. See? That is how I made my cheap armor that doesn't look too bad. 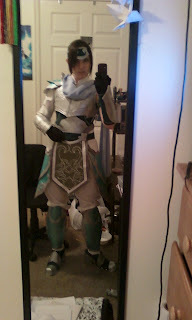 The same process was used for the thigh bits, the bracers, and the boots.